Colomers and Jafre are small villages that sit along the river Ter just to the west of Verges, so a little off the beaten track. The main reason you might visit Colomers is to hire a kayak from the canoe centre and gently paddle along the languid undeveloped Ter to Verges where the canoe centre will pick you up - a great alternative day out to the seaside. 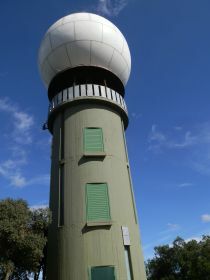 Alternatively you might come to Colomers for the ballooning centre next door. We're here to see the villages. We've had fun with the canoeing in the past, but didn't stop to look at the village so this time we park at the field by the double-decker London bus that houses the canoeing centre and walk into town. 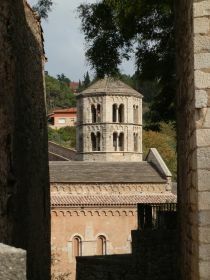 Colomers itself is a typical Empordan walled village rising from a height above the river (in the past the Ter would have flooded badly) to a church, a tower and then into the hills. The houses are generally being renovated, but there are still a few as yet untouched with the charm of grass growing on the roof and flowers growing out of the walls. After a brief tour of the village we follow a pebbled path up the outside of the what would have been the old walls to the top of the village and then cut onto a track that takes us into the woods beyond. It's a pine wood with sandy ground under foot and very open and spacious. For October, the day is surprisingly warm - into the upper 20s and the shade from the trees is welcome. A little way of the village a red squirrel scampers up one of the pines with our dog barking at it loudy from the bottom of the tree. The path through the woods is one of those walks you like to take without necessarily having any highlights. Just an enjoyable hike surrounded by nature with no-one else about. We pass the top of a field and then come to a crossroads. The one problem with the woods, is that it's not quite clear which path is which, so we just follow our nose straight on, not particularly worrying if we get slightly lost. However, we're about right and we wind our way into the woods. At the next junction a little further on, the tracks are bigger to give access to timber lorries and there are signs of wood clearing all around. In these sorts of woods, during summer fire is a continual risk, so the woods need a level of management to reduce the fire-risk. However, the lumbar tracks don't help with directions so we continue, just about making our way to a path that runs along the top of a wooded hill turning south towards Jafre. The path emerges into fields and a pig farm. Across the fields are buildings - these were going to be a thermal spa. Apparently at one point they were doing test drilling for oil, but they didn't find it. Instead they discovered hot water. So the intention was to build a baleanari fed by the hot water. At least that was the plan until the money ran out. 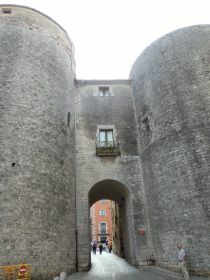 We walk into Jafre along the upper road. From the geography it seems that this might have been on the upper bank of an ancient lake from millions of years ago. Maybe the Ter or the sea were much much higher then. But enough speculating, we enter what is a relatively linear village and walk to the church, with the old castle building attached. Jafre is more work-a-day than Colomers but retains it's older buildings. Hot from the sun we rest on a bench next to the church, before walking down the hill and out to the flat of the Ter's floodplain. 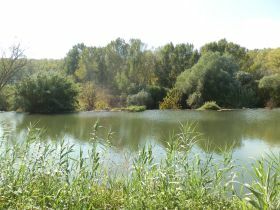 The path doesn't connect us to the river though and we walk through fields recently stripped of maize across to Colomers, stopping to visit the bird hide that looks out over the river and weir. 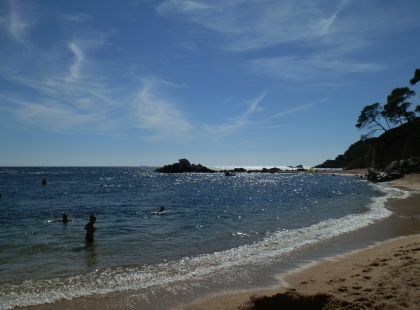 Between Cap Roig, just south of Calella de Palafrugell and the beach at Platja de Castell, are a series of wild natural beaches and coves that start from El Crit (Mont-ras) and then run into Cala Estreta and around to Cala Senia. 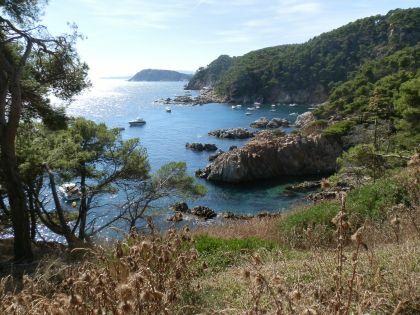 Although it is possible to drive and park above the beaches out-of-season, during the peak summer months access is only available to walkers and bikers from the path that runs across the top from just outside Cap Roig connected to Platja de Castell. Paths drop off the upper route down the hillside to the beaches below. 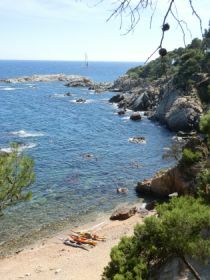 The isolated nature of the beaches, and the ease of reaching them by canoe from Calella de Palafrugell or Castell mean that they are popular destinations for canoeists, while the rocky bay makes them popular with snorkellers, though the bays can be a little difficult to get into because of the rocks underfoot. There are no facilities at the beach and no lifeguards. These are left wild and open deliberately. Each of the beaches has a fisherman's hut and sometimes one or other of these building is open. The only concession is that the swimming area is marked by buoys out into the bay. The beaches typically sit under cliffs (take care for falling rocks) and visitors to the beach might make fires for barbecues and occasionally you see a tent with people wild camping, but it's not encouraged. The sand quality varies according to the beach. 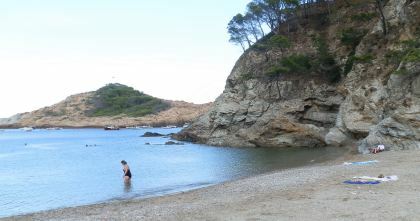 From Cala Estreta around, the beaches are mainly of a fine to slightly yellow coarse sand which is fine for sunbathing. El Crit, the beach closest to Cap Roig, has one half of the beach that is coarse sand, and a second half, through the hole in the rocks, that is pebbly. The main problem for swimmers or paddlers, is that the bays themselves are rocky underfoot almost immediately, making entry and exit from the water hard under foot. The small bays are relatively shallow with lots of rocks at the bottom and clear water. This means the water can be warm even into September, but the rocks at the bottom mean you do need to watch for the depth of water - in some places rocks get close to the surface and in other places a shallow rocky bottom can sudden drop into a deeper hole. It's advisable to wear goggles and to look how far the sea bed is beneath you when swimming - it's very easy to start to treadwater only to find yourself kicking a boulder. The main problem for swimming is normally picking a path among the rocks when getting in and out. In El Crit, and some other places, it's easier to get in from the rocks at the side of the bay than to get in from the beach itself, but again be careful with water depth - the unevenness of the bottom, means it's not suitable for diving from the rocks into the water. The open and wild nature of the bays mean there are lots of fish, sea plants and wildlife in the water (potentially including the odd jellyfish). Out towards the islands and rocks away from the shore, the sea can become choppy so some care is needed when there is a swell on the sea. The shorter nature of the bays and the risk of hitting rocks mean it can be difficult for long distance swimming, but make it perfect for snorkels and exploring. Lots of people access the beaches by canoe, or use canoes to explore the rocky headlands or to navigate among the islands. 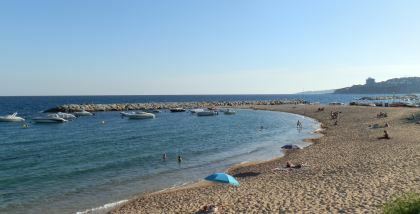 Canoe hire can be made at Platja de Castell. It's easy to pick routes between the islands and the sandy beach makes it safe to take the canoes out of the water. Again, when coming close to the beaches, do watch for rocks. Being relatively open getting out of the bays and around the headlands, the water is more exposed and can be choppy on windy days. Outside the main high season, when the access road at the top is open there is parking above Cala Senia and a little above Cala Estreta, but the road is a gravel track and driving can be difficult. We would park and walk from Cap Roig to reach the beaches (about 10-15 minutes). 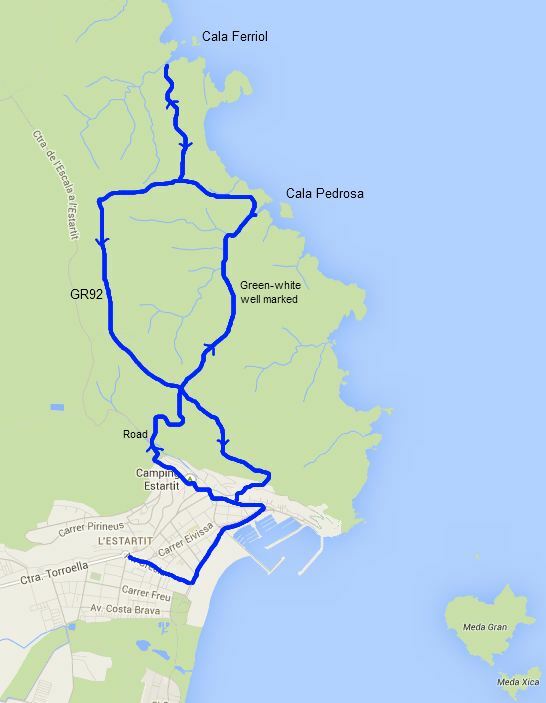 The alternative is to park at Cap Roig, but the walk is a little longer. 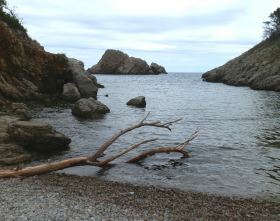 The path along the beaches was included in the Calella de Palafrugell/Cap Roig to Castell - classic wild Costa Brava walk. 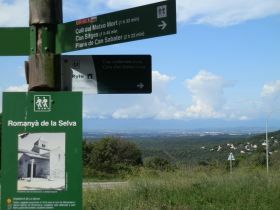 The Ruta del Tren Petit path has access points to the beaches if you are coming from Palamos, Vall-llobrega or Mont-ras. 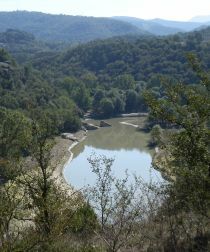 The Gavarres hills are the major inland geographical feature of the Costa Brava. These are hills that rise to about 500m at the extremes and stretch from just behind Girona to the hills at Mont-ras, just behind Palafrugell. 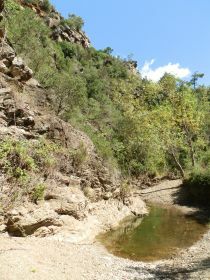 The hills are a protected natural area with a great number of tracks and paths, almost totally accessible to the public. 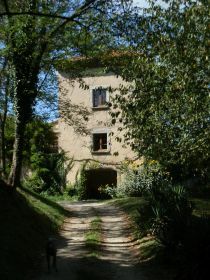 The terrain is mostly wooded with cork and alzina oak trees, but with lots of hidden valleys and streams with occasional ancient masia farmhouses. As a natural space, the Gavarres are wonderful for walking and exploring with views to the coast from all directions yet feeling almost completely separate from civilisation as the hills are only crossed by road in three places - at Els Angels, between Sant Sandurni and Cassa de la Selva and between La Bisbal and Calonge. There are other gravel tracks and forestry routes into the hills but these are only really suitable for 4x4s with good ground clearance. As a result it's a fabulous area for walkers and particularly mountain bikers. 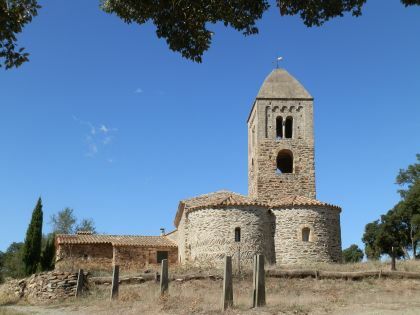 In the hills directly above Mont-ras/Palafrugell is a small isolated church at Fitor from the 10th Century. As you skirt the hills from below, you'll often find a Cami de Fitor referring to a path that climbs into the woods and take you to the church. For many people here, walking to Fitor is something of an annual pilgrimage to reconnect with the Gavarres and local history. We've walked up three or four times. The first time we did it was pretty much straight up and down, but as it's a relatively long way up to Fitor (about 6-7km) and because from Fitor you can walk down in any direction, now we tend to walk to the church, then down to one of the other towns in a different direction. This means it's a linear walk so we have to arrange transport back. This time we're just in the middle of September and it's time for our annual visit. Temperatures are still warm but there is a freshness returning and the air is becoming clearer so the views to the distance are returning. 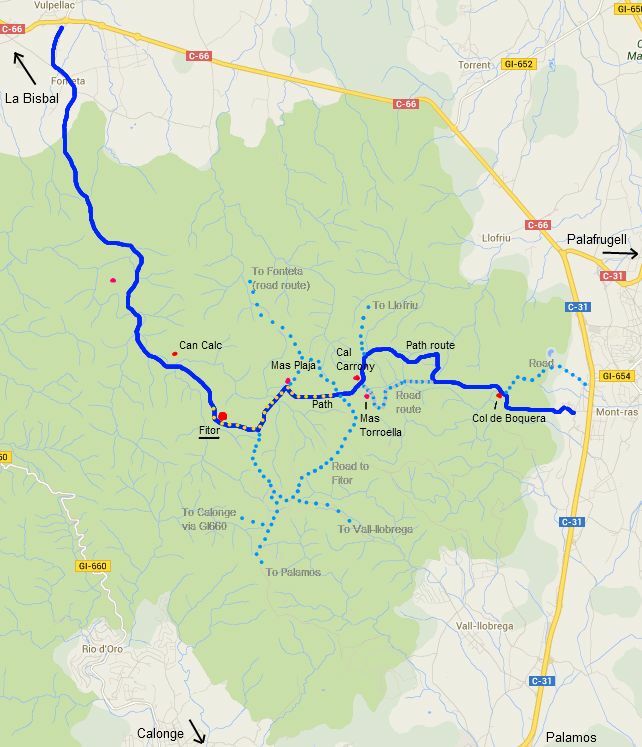 We're starting in Mont-ras with an aim of walking over the top to Fonteta just outside La Bisbal. There are a myriad of routes up into the hills and even though there is good signposting, it's very easy to get waylaid without a map - Google just doesn't show enough routes. 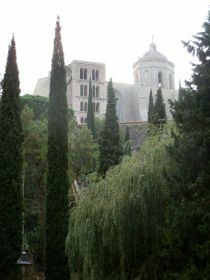 We start at Mont-ras church and walk up into the hills along the track with the misnomer of Carrer Major. We walk this area a great deal and there are numerous routes up to the top at Col de Boquera - including the route take on the Mont-ras Fountain walk. We take one of the easier paths that winds its way up the side of the hill. At Col de Boquera, we're on the 'road' - a wide gravel track that is suitable for vehicles and is used as an access to the farms on the top of the hill. The road is always a little too broad and a little too dusty so we don't take it too often, but its the main connecting route to Fitor. It runs along a saddlepoint. 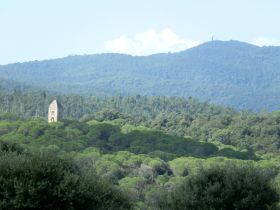 and through the trees on one side you can look out to the coast at Pals, and then a few minutes later on the other side you can see the sea in the direction of La Fosca with the valley of the 'Mont-ras boar walk' down below. The road runs all the way up to the farm-houses on the top, which is where we're aiming to reach, but we prefer smaller tracks, and half way along the part of the road with views to La Fosca, there's a track that runs up the side of the hill to the right. This is a narrower path only suitable for walking or biking (it has lots of bike tracks in the dirt). This path climbs around the hill in amongst the woods and trees and we just have to remember to take the left hand fork at the only point the path splits. Eventually (15-20 minutes) it reaches the top road signposted to Llofriu down, or to the left around the top to Fitor. We head towards Fitor and can see Mas Torroella on the other side of the hill - the road passes what is a very sturdy looking masia, but we won't reach that far. Following the road, we pass Can Carrony - a large orange painted masia that stands on the crest with views out across Begur and Calella to the sea. The farmhouse is quiet, but we've passed when there have been great gatherings of visitors taking lunch outside. The farmhouse also sits in a flat area of fields. It always seems a little surprising that coming out of the dense woods below, at the top it's open with fields. Historically though, this is an area that has been farmed for centuries and for the group of farms on the top, Fitor was their church. We take the road between the fields, still in the direction of Fitor and come to a crossroads. A motorcyclists on a track bike is buzzing across the road - the area is also popular for off-road moto too. At the crossroads the main signs point to the left along the road to Fitor, but look out for a darker green pedestrian sign which indicates straight-on. The left hand road is broad and runs along the top, but is a longer route to Fitor. The footpath is shorter and prettier so we head straight on looking out for yellow-white flashes, which aren't always that easy to see. The path runs into the woods and then through to more fields. We're heading to Mas Plaja, but an arrow to the left points to Fitor Viens (Fitor neighbourhood). It takes a while, but we find the yellow-flashes on the right hand path and continue down to Mas Plaja, an old masia festooned with flowers. Again we lose the yellow-white flashes and have to check on the map. At Mas Plaja we have to take a left along a track that seems to run past their horta (vegetable garden). It's then across a stream - there's water up on the Gavarres even at this time of year - and up to Fitor. You can see the church at Fitor standing isolated in among the fields from the track as you get closer. It's been renovated in the last two or three years, but it retains a charm and character, not least because the small tower isn't quite vertical. The church sits next to a small old house which is used as an occasional shop for refreshments, but then that is it - no other village or buildings nearby at all. As we come to the church we pass a car parking area, so it is possible to drive up the tracks if the walk seems too much. Normally, we would also see mountain bikers at Fitor, taking a break on the picnic tables, but this time there is no-one about. From the church itself a number of different tracks and paths run off in different directions - to Calonge, or to Palamos or down to Vall.llobrega and Bell.lloc castle. We keep on the yellow-white route in the direction of Fonteta and just as we leave Fitor we meet another person coming up the other way. The track runs downhill and then splits at Can Cals. We take the left fork and then take the next track to the left down and across the valley, but it seems that the paths would have converged. Around Can Cals, a small stream is still within the rocks, but still has water it and over the next little while the path follows the stream down until we reach another set of rock-pools underneath a small rocky outcrop. As an explore we walk along the rocks of the stream, disturbing lots of small frogs who jump back into the water as we pass. In winter with full rain, it looks like the stream could easily be a torrent through here. 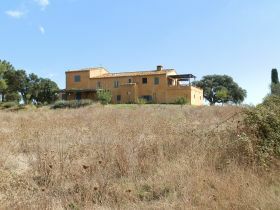 Back on the path and we get the first sight of Mas Anguila a very large impressive masia sitting on top of an isolated hill above the valley in the process of being renovated. The path takes us in a semi-circle around the Mas so we keep catching glimpses of it as we walk. The path continues over the Pujada Rossa and to La Creu dels Frares. 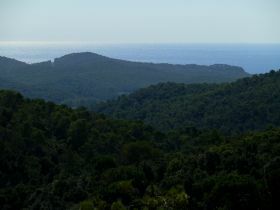 At La Creu, we can look out across the Empordan plain out to Torroella and the Isles Medes in the distance. It's not long now, and we come down the hill emerging past a riding school before finally getting onto tarmac and into Fonteta. We walk through the centre, then out to Vulpellac for our lift home. Although originally L'Estartit was a fishing village it has become more of a resort catering to holidaymakers and second-home owners including a reasonable community of British ex-pats. It's also the connection route to the diving mecca of the Isles Medes, which according to diving friends, is one of the best locations on the Mediterranean. The town of L'Estartit always feels like going to a different country. 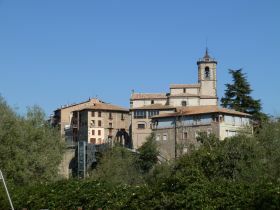 The town is slightly isolated as access is only possible from Torroella de Montgri with the river Ter to the south, and the Montgri hills to the back preventing any other access. 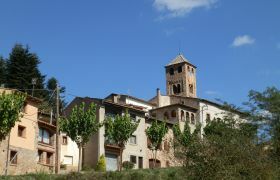 Consequently, the town is almost entirely geared to holidaymakers as it is not really well enough connected for local inhabitants. Having said it's mainly for holidaymakers, this is not in a large or overgrown way, but it does have some well-design holiday hotels and apartment blocks and the main strip in the town is almost entirely shops focused on the tourist trade (and dead quiet in winter). The town's strong point for locals is that it is the main access point for the Isles Medes, two islands off the coast sufficiently large to have a lighthouse, that are the centre of a sea-based nature park famed for the quality of the diving. If you're visitng L'Estartit, then taking one of the many glass-bottomed boats to the Islands is recommended. If you're a diver (we're not), friends really recommend the Isles Medes. Behind the town is the Muntanya Gran of the Montgri mountains a large and very natural set of hills, cliffs and shrub that separates L'Estartit from L'Escala. We've walked this area before but have never quite got it right. The first time we were trying to follow the coast to L'Escala but came in the wrong shoes (the hills have a seriously rough under foot terrain - anything other than good walking shoes is not recommended). There's also a good walk along the ridge top over L'Estartit. Previously we've also tried to get up in to the hills above the furthest point of the port, and now we've discovered the best access point is the road up behind Camping Estartit which makes the start of the journey much easier. Google Maps doesn't show the paths very well, but they are clearly marked with signposts and green-white flashes and easy to follow on L'Emporda en Detall walking maps. We normally park near the photographers' shop who always has a great set of local pictures, then walk down to the beach. The beach has a fine sand and is gently sloping, but at the back are large areas used for parking. It rained overnight, so there are a few puddles, but out to sea the Isles Medes are the dominant feature. We explore the town a little - it's not somewhere we come to very often, and even at this late stage in the season there are still visitors from the UK and Netherlands about. After a skirt through the town we head out and follow the road in the direction of Camping Estartit and get the first of the walking signs. 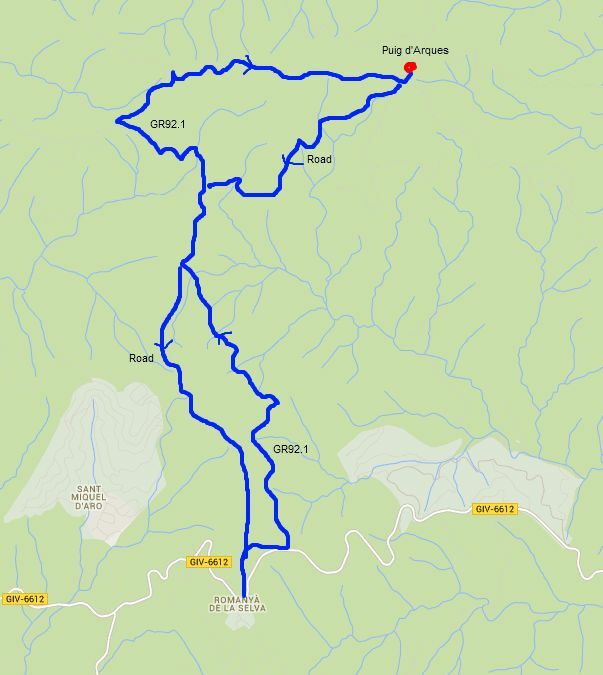 The route we're following connects to L'Escala/Montgo as well as the hidden Calas. The road runs past the campsite and continues up. To the right, above the campsite are some non-sea cliffs with a path running across the top through the woods (a good local route if you don't want to go fully onto the Montgri hills). Instead we continue with the road and it turns into a track with white painted rocks on either side - part of the access to Torre Ponsa. Our route then splits to the right rising steeply and we can see the grand Torre Ponsa buildings with Montgri Castle behind it. At the head of the road the terrain changes to the more typical Montgri terrain of rough stone underfoot and small shrubs dotted with alzines. At the crossroad, the paths are clearly marked with good signs and we take the route to Cala Pedrosa and Cala Ferriol along a stony track. The path is clear and easy to follow (we pass a couple of mountain bikers coming the other way), then the path to Cala Pedrosa turns off to the left and becomes a little narrower with more stone. The terrain of the Montgri hills has a tendency to get harsh underfoot. It's a bit like walking over the remnants of a collapsed dry stone wall all the time with stones and rocks pointing up at odd angles making the path very uneven. Our path runs down through the woods and then along a dry river bed and we reach Cala Pedrosa (the stony bay). It's a pebble beach, with access to a channel of sea water. The whole beach/channel is about 10m wide at the widest Very natural, very stony and fine for skimming stones across the water, but not much else. The path now climbs out of the bay and up to the top. After an easy climb we reach a viewing point and can look back towards Cala Pedrosa and the Island of Pedrosa (also very stony), and in front of us we can see the remarkable cliffs and headland of Roca Foradada/Cap del Castell which juts out into the sea with sea cave and sea tunnels at the bottom and behind in the distance we can see Roses and Cap de Creus. The cliffs along the coast are high and vertical, and thankfully the path steers around the back. Now as we're walking we run into a couple of other families with children younger than ours, properly shoe'd up for the rough ground. It feels like we're in the middle of nowhere surrounded by low shrub with no buildings or other access around so it comes as a slight surprise. We reach the top of the hill and our children cop out of the next stretch down to Cala Ferriol to avoid another climb out of a bay. We continue though and walk down along a broad but stonily-uneven track to get to Cala Ferriol another pebble beach but broader that Cala Pedrosa. There are a couple of small islets in the bay and a huge cliff above. Among the natural scenery, it looks like humans have created a space for fires in among the rocks. On the map there's a second path out of the bay and back to the top, but we have to go back the same way we came. We walk past the families we saw earlier coming down. At the top we follow the flattish path in the direction of L'Escala (still well signposted), and then follow a flat track GR92 back towards Torroella and L'Estartit. We can't see the sea, but to the right as we go south are views towards Montgri and out to Bellecaire d'Emporda and the Pyrenees beyond. The GR92 bears off to the right, but we continue straight on the path to the crossroads where we took the route to Cala Pedrosa. We carry straight on and get to the heights above L'Escala, continuing along the top until we find a route down and back into town. 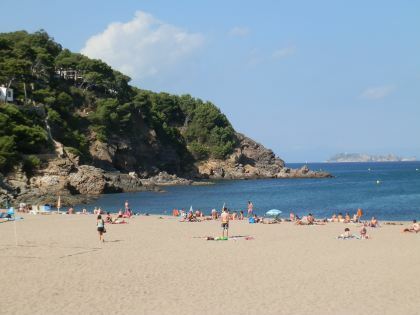 Sa Riera is the largest of the three Begur beaches (Sa Tuna and Fornells/Platja Fondo/Aiguablava being the others) and the closest directly to the Begur town itself, though it is still 2-3km downhill. The beach is situated in a small older village directly around the beach surrounded by hills with select luxury villas. The village area has a handful of restaurants, a couple of shops and a small supermarket all of which are open during summer, but normally closed out of season. It's picturesque with views, but feels a little more touristy than Sa Tuna or Aiguablava. 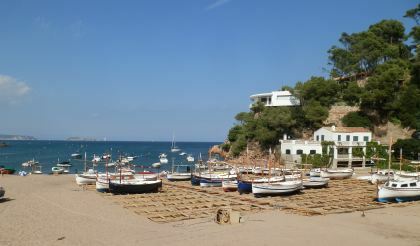 The beach is large and sandy at the base of the stream that runs down from Begur, with space for fishing boats to the right-hand side with boats on the beach and in the water. It is framed by rocky cliffs to the left looking out to sea with a path that runs over the top to Platja de la Isla Roja and Platja de Pals. On the right is a smaller second beach and a small rocky headland with a villa on it. The beach is north facing and looks directly towards the Isles Medes. 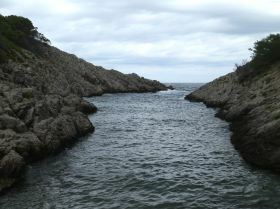 If there is a south wind blowing, Sa Riera is protected and remains perfectly calm for swimming. At the back the road comes down from Begur on a windy road that becomes a relatively narrow valley with low-rise holiday apartment blocks as you come into the main Sa Riera village and the number of villas mean the area is very popular for villa and apartment rentals, but it is typically closed up during the winter. Being relatively large and popular there is canoe hire, lifeguards and a diving school at the beach. As mentioned, in the village area are a few seasonal restaurants. The swimming area is marked off by buoys far into the bay and in fact the buoys are situated so that the swimming area extends right around the cliffs to the beaches of Platja de la Isla Rojo and Platja de Pals. The sand is coarse to grainy and a little grey and dusty and not really good for sandcastles. it's also a big beach so there is a lot of sand to cross in order to get to the water. Swimming is best towards the left hand rocks. The main bay area is mostly a sandy bottom with little to see, though with the buoy positions, it's possible to swim out a long way. The rockier left hand side and more of interest in the water and for long distance swimmers it's relatively easy to swim around the cusp of the bay into the next beach and beyond. Parking is mostly along the entrance and exits roads with a charge in season for the parking closest to the beach. We were swimming just out of season (mid-September) and there were no problems parking. In season, it will be busy which will mean parking a little further away and walking down to the beach. La Jonquera is a border town just below the main pass in the Pyrenees that separates France from Spain. This pass has been used for thousands of years by peoples moving between the Iberican Penisular and mainland Europe. 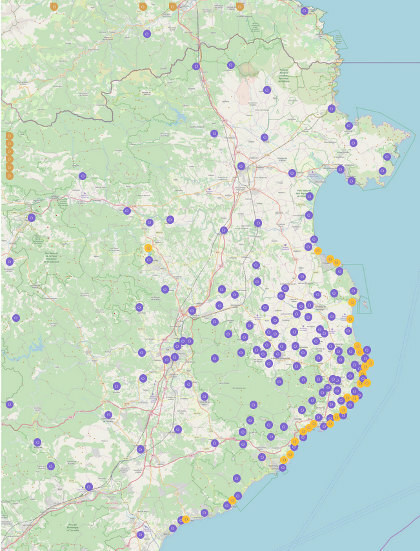 The Roman's came this way and built the historic Via Augusta road that runs all the way through Spain down to Cadiz and links with the Via Domitia on the French side of the border. With such a long history and with such strategic importance, both sides have built castles and forts to defend the border. As you drive along the modern autoroute if you look up, you'll see Fort Bellegarde - a Vauban chateau fort built in the 1690s after France annexed Catalonia North. 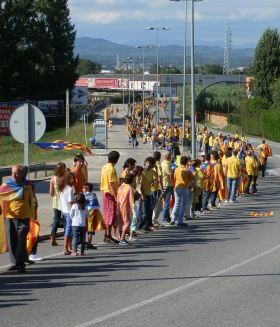 The road itself was also important as it was the main route out of Spain for tens of thousands of Republican refugees fleeing Spain at the end of the Spanish Civil war. 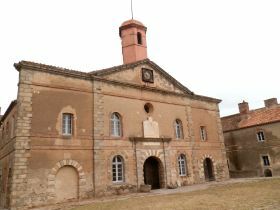 La Jonquera has the museum of exile which states that at one point La Jonquera had around 500,000 people in the town looking to flee into France. 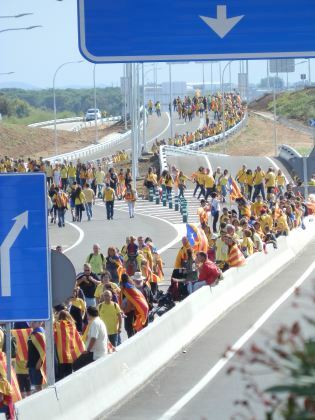 Nowadays, La Jonquera is a brash shopping area for day-trippers from France coming to stock up on perfume, wine and cigarettes at the Spanish lower tax rates, and as a truck holding stop with artic lorries from across Europe parked up to avoid the French restrictions on when truckers can be on the road. As you drive past it's not obvious that there is an older town hidden behind all the gaudy supermarkets, advertising and petrol stations. The idea for the walk was from our children who were thrilled with the idea of walking to France (and we did take passports just in case). 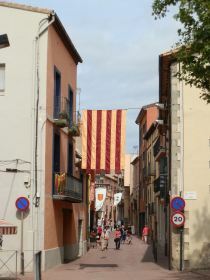 Despite being a Sunday, La Jonquera was busy with cross-border tourists out for a bargain and it was the Festa Major in town, so we had some difficulties parking. We eventually found space on the south side of the town, which meant we could walk through the centre to see more of the town on our way north. The Via Augusta route is one of those suggested on the Costabrava.org website and we were looking out for yellow-blue marking. These, together with scallop shell symbols, mark the Route of Saint James (Camino de Santiago) which connects all the way to Santiago de Compostela in Galicia. Unfortunately where we started from we couldn't find the symbol, and the marked walking routes and maps in the town tended to be more circuitous routes into the hills longer that we planned. So instead we followed our nose through town. The centre had decorations up for the festival and a line of ladies making lace with needles on cushions and dozens of bobbins linking threads to make the patterns. The centre is small but has older buildings and a church and is very pleasant for a stroll. We continued through the town past the numerous clothes and souvenir shops including a big pile of mexican sombreros - something which isn't really Spanish, let alone Catalan. Eventually we started to come out of the town and it still wasn't clear where to go. Outside the customs house, the main road split to the main motorway or the N II - neither of which we wanted to walk along, and ahead of us was an large empty expanse of concrete that presumably would have been used to hold trucks before the border was opened under Schengen. We guessed and crossed the concrete and just the other side of the last town roundabout finally saw the first yellow-blue marking. The path itself didn't seem that well used with gorse and brambles growing across the track. However, after the first stretch we crossed the NII and under the motorway and started across the fields towards the hills. The path now ran through fields with the motorway on one side and the new AVE high speed train line on the other. At the end of the fields the path joins a road that leads up to the service buildings for the new Pyrenees train tunnel into France. Our path continued up and over the top of the tunnel following a track that climbed steeply into the woods. Last year (July 2012), a huge forest fire that burnt a stretch of woodland and forest nearly 40km long from the border back down almost to Figueres, and so much smoke that that it reached Barcelona. We drove past about a week after it happened and it looked like total devastation - with every tree seemingly caught by the fire and left as black leafless sticks as if nothing had survived. Now walking through the woods you see the resilience of the corks trees and the forests. The fire has cleaned out the undergrowth, but the woods are back to green as new plants have grown. And the cork-trees with their blackened bark are back in leaf. Foresters are clearing out the genuinely dead trees, but the thing with cork-bark is that it is a fire protection. Only the very outer part of the bark burns and as cork bark continues to grow from the inside out, slowly the damaged outer bark is rejuvinated by the bark underneath. It's the same principle that enables cork to be harvested by stripping the bark from the tree, without damaging the tree itself as the bark grows back. We climb steadily past large boulders and rounded weathered rocks. 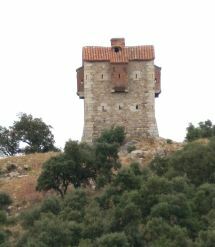 Ahead of us we can see the fort, but also a strange tower-house which looks like it has a face. We carry on following the marked signs up to Col de Panissers and arrive at the ruins of the Roman fort built on the col. As we look around the fort and read the description of the ruins we're not entirely sure if we've crossed the border, but we discover that the pyramid just above the ruins marks the border so we can stand one foot in Spain and one foot in France. 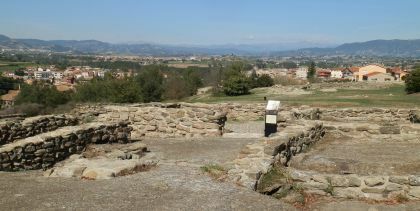 The sign on the ruins marks the change of road from Via Augusta into Spain to Via Dolmitia into France. 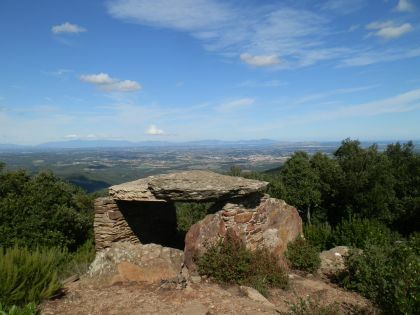 To the north are great views down the Vallespir valley and onwards to the plains of Roussillon and the Corbieres mountains in the distance. Behind up we have a view that looks all the way to the Montgri hills. Above us is the main fort that can be seen from the autoroute - Fort de Bellegarde so we walk up to the fort itself. 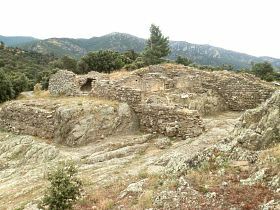 The fort is one of the Vauban forts like that of Villefranche de Conflent and Mont-Louis further up in the Pyrenees - a large dominant fortification built after the annexation of Catalonia north in the seventeenth century with thick walls and remparts and few comforts. It stands above the main autoroute and we can look down at the crossing point with lorries passing over the now open border. The town beneath us is Le Perthus - distinguished by being half in France and half in Spain with the border running straight down the middle of the main road. We take the chance to explore the fort a little. Many of the rooms are now used as galleries displaying paintings and sculpture but it still feels like an indomitable castle. 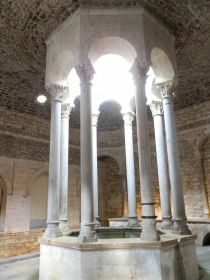 In the tower on one corner is a deep deep well that was the main source of water. The height of the walls and the castle's position means there are fabulous views in all directions and down to the former border, but it is a harsh building with few comforts - perhaps in keeping with it's history as a prison used by the Gestapo in the Second World War. 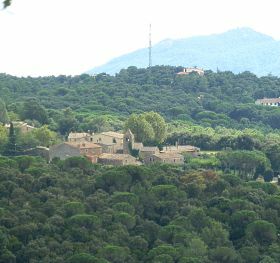 Though we prefer circular walks, the route back to La Jonquera mostly takes us back the same route as we came up - a slight diversion around the military cemetary links to the same path down to the top of the AVE train tunnel with views along the tracks down towards Figueres. At the bottom of the path, rather than follow the overgrown route we had discovered with difficult, we take the Pyrenees 8 Bike path along the side of the railway and motorway which is more open and rural and follows a stream back under the railway and motorway and back into La Jonquera and the mad stream of cars and people bustling around the cross-border supermarkets. Sa Tuna is one of the three beach area connected with Begur (Sa Riera and Fornells/Platja Fondo/Aiguablava being the others). Sa Tuna itself is at the back of Begur around the Circumval.lacio down a 2-3km long windy road to the sea. At Sa Tuna itself is a small hamlet of what would have been fishermen's houses sitting above a quiet bay with fishing boats, and a handful of restaurants above the main beach. Around the corner is the bay of Aiguafreda with the large hotel of Cap Sa Sal on the neighbouring headland. The bay itself is enclosed on three sides and protected from the sea by a promentary/penisular marked with a Catalan flag that juts out into the sea on the opposite side of the bay. The main beach sits in front of the restaurants with boat access, but once you get out into the water, you can see a second beach around to the right, accessible easily from the water, or a scramble down from the path that runs over the cliffs. From the water itself you also see the small sea caves in the cliff walls. The beaches are pebbly rather than sand, with rocks in the bay. The natural landscape of the bay makes it perfect as an area to explore by canoe, or for diving. Though the beach itself is stony, it does attract holidaymakers and there is a lifeguard service and canoe hire. Directly behind the main beach are a handful of restaurant and the occasional small shop that blend in with the traditional fishing hamlet ambience. The second beach is isolated and accessible via a scramble off the path, or directly from the water. It's fair to say there is little in the way of sand at the beach, it being almost all pebbles. The bay is also rocky which makes entering the water somewhat cautious and tentative when the water's chilly. Swimming is good with a good variety of places to explore. 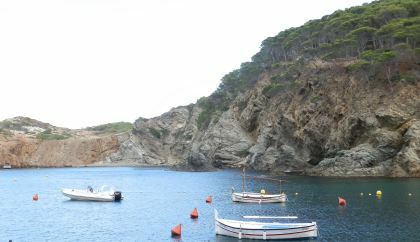 The boats are moored on the left-hand side looking out to sea, so though it is possible to swim around the headland to Aiguafreda (also a pebbly beach), it would mean swimming across the main boat channel. Swimming to the right gives views of the cliffs and caves with rocks under water. Though the bay is rocky close to the shore, in the centre it tends to be a little more sandy. The geography with the promentary/penisular and the neighbouring bays makes this a rewarding area to explore by canoe with plenty to see in an hour or two's canoeing, particularly if you're kayaking and swimming. The shelter of the bay gives good protection and smooth water, but if you go out around the headland, the water becomes more open and can become choppy. Parking can be difficult as there are a limited number of places. Parking extends up the access road, and the general advice would be that if you see a space take it. Parking around the main harbour is tricky. 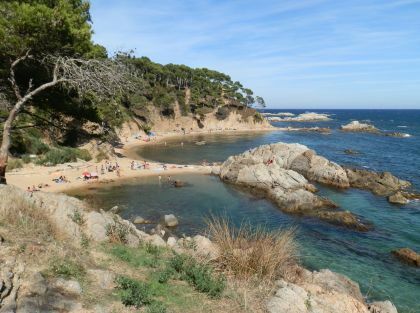 Sant Antoni de Calonge sits next door to, and is sometimes confused with, Palamos as the long sand beach links the fishing port at Palamos around the bay to the hotel and rocks at Torre Valentina. 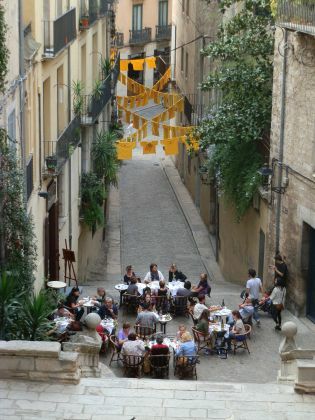 Although there is a traditional old heart to St Antoni, in the main the town consists of more modern apartment blocks, hotels and terraces of houses that line up 4-5 rows deep from the beach back to the main road that connects Palamos to Platja d'Aro. The town has other areas and links to Calonge and villa estates and campsites above Torre Valentina but it has the feeling of a faintly underused purpose-built holiday area that lacks a little in character or pizzazz. The beach area consists of a number of artificial bays protected by groynes of rocks to keep the sand from being washed away. If you're familiar with the beaches in Barcelona, this area has a very similar feel and quality. 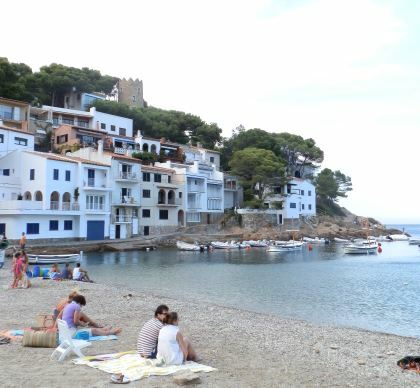 At the back of the beach is a long promenade that would take you all the way to Palamos or round to Torre Valentina. 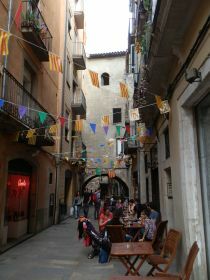 Though there are a few smaller hotels, the area is mainly residential and quiet, with a handful of bars, shops and restaurants. The beaches with protection running parallel to the beach form a number of small and very sheltered bays. Some are used for mooring boats in addition to sunbathing, and because of the protection, the water keeps warmer than the open sea, and the sand shelves gently making it family friendly for smaller children. Unfortunately that doesn't get round the artificial feel. If it was a city and the only beach it would be OK, but with so many other better Costa Brava beaches nearby, there's not really a reason to use this one. The beaches have lifeguard stations and in places on the promenade at the back there are occasional shops and bars. Swimming areas are marked out with buoys. The beaches with long groynes reaching out to the sea are more open and feel more natural, with fresher water and more chance of waves. The beaches behind the parallel rocks are warmer and more sheltered by feel much more artificial. Sand quality varies along the beach. In parts it feels fine, in other areas it is grainy and stony. If you do use the beach, walk along the sand to find the best areas. Even in the parts that are stony, the area at the water's edge can still have softer sand. The only positive benefit for swimming was the possibility of warmer water earlier or later in the season. The bays have a sandy bottom and the odd fish can be seen, but it feels very man-made. If you are in the direct local area, swimming across the small bays would be good exercise, but nothing to really get excited about. There is parking at the back of Sant Antoni closer to the main road. 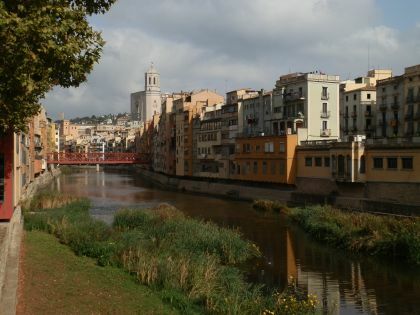 This is an area for passeo from Palamos to Torre Valentina rather than a mainstream walk.